Autoimmune thyroid disorder is the most common form of autoimmune disorder affecting 5% of the general population. Graves' disease (GD) is an autoimmune disorder. It is characterized by autoantibody binding to the activated thyrotropin receptors, which leads to high levels of thyroid hormones in the circulation. This causes a variety of thyrotoxic manifestation such as heat intolerance, weight loss, tremor, palpitation, and exophthalmos. However, GD is not always present with typical signs and symptoms in clinical practice. Less commonly, GD may present with single-cell lineage hematological abnormalities such as anemia, leukopenia, and thrombocytopenia. We present a case of GD-induced pancytopenia associated with elevated liver enzymes and the role of thyroid uptake scan, antithyroid drugs (ATD), and radioiodine therapy in patient management. A 31-year-old woman presented with palpitation and dyspnea on exertion with weight loss of approximately 10 kg over a period of 12 months. She also noticed swelling of the neck for the last 1 year which she informed was progressively increasing in size. On clinical examination, she looked tired and afebrile and had a pulse rate of 124 beats/min, blood pressure of 104/58 mmHg, and respiratory rate of 20/min. She had mild exophthalmos, raised jugular venous pressure, diffuse goiter with positive bruit, and bilateral pedal edema. She was anemic, but there was no icterus. Her abdominal examination was unremarkable with no tenderness or organomegaly. [Table 1] shows the blood investigations. The prothrombin and activated partial thromboplastin time were within normal limits. She was investigated further for autoimmune hepatitis. However, immunological markers such as ANA, AMA-M2, LKM-1, LC-1, and SLA/LP were negative. Although she was positive to HBsAg, the HBV DNA titer was within normal limits. Direct and indirect Coombs test was negative. 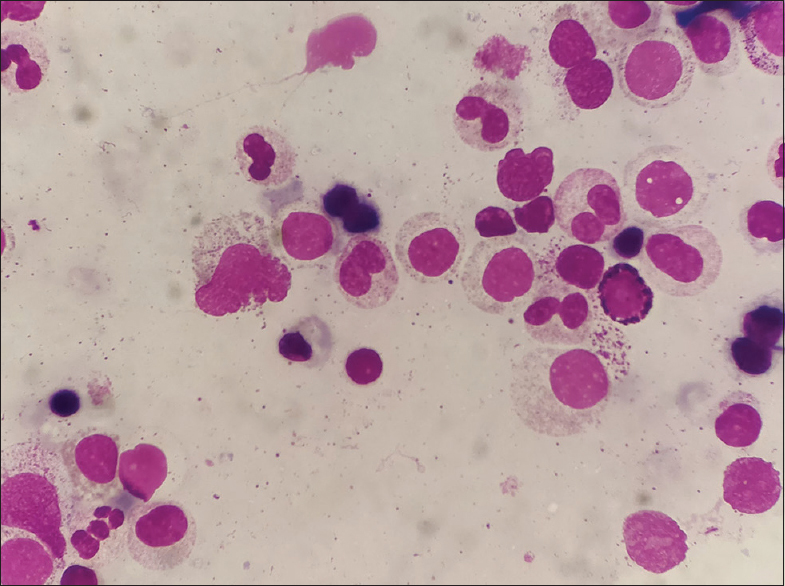 The patient had pancytopenia, and hence a bone marrow aspirate (BMA) was done. BMA showed hypercellularity with erythroid hyperplasia [Figure 1]. There was significant dyserythropoiesis in the form of binucleation, nuclear budding, nuclear membrane irregularity, and maturation arrest. However, there were no ring sideroblasts. Megakaryocytes were adequate in number, but there was no dysplasia. There was normal maturation of neutrophils. Neutrophils showed hypolobation and hypogranularity. Perl's stain for iron demonstrated absent iron stores. Overall features were consistent with pancytopenia induced due to thyrotoxicosis. Bone marrow biopsy [Figure 2] showed similar features as shown in BMA. Ultrasonography of the abdomen revealed no hepatic and splenic enlargement. She underwent technetium-99 m thyroid uptake scan [Figure 3], which showed diffusely increased homogeneous tracer uptake in the enlarged thyroid gland, suggestive of diffuse toxic goiter. The tracer uptake at 20 min was very high at 46.5% (normal 0.3%–4.5%). She was treated with tablet carbimazole initially. The hematologic and liver parameters were monitored. 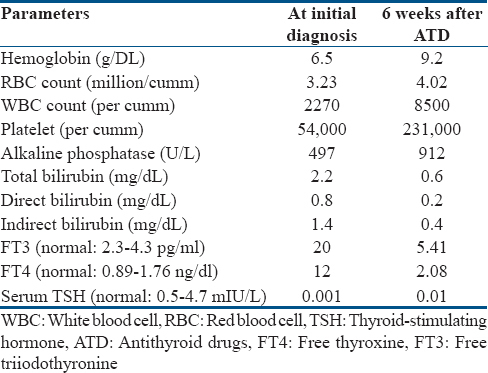 On follow-up after 6 weeks, the patient was clinically better; the thyroid function test had improved with improvement in blood counts [Table 1] and decrease in total bilirubin level. As ATD itself can induce pancytopenia, the patient was further treated with radioiodine (Iodine-131). The present case was unusual as it presented with GD, pancytopenia, and hepatic dysfunction. The blood counts and hepatic enzyme levels were normalized promptly after improvement in thyroid hormone level. GD with pancytopenia has been described rarely in literature.,,,,, Single-lineage abnormalities are more common in patients with hyperthyroidism. In hyperthyroidism, anemia, leukopenia, or thrombocytopenia occurs in approximately 34%, 5.8%, and 3.3% of patients, respectively., The anemia in GD is usually anemia of chronic disease. Bone marrow examination usually shows hypercellularity (as in the present case) or normocellularity, but rarely hypoplastic changes. The pathogenesis of GD-induced pancytopenia is not clearly understood. The various proposed pathogeneses are (a) direct effect of thyroid hormones on hematopoiesis, (b) reduction in blood cell lifespan caused due to autoimmunity, and (c) toxicity of thyroid hormone to bone marrow stem cells.,, However, in most of the cases, there is prompt improvement in blood cell counts with normalization of thyroid status, which suggests that there is some direct effect of thyroid hormones. Further, pancytopenia has also been reported with hyperthyroidism forms other than GD such as multinodular goiter  and even with overdosing of levothyroxine. This further indicates probable nonimmunological mediated theory. To add, in the existing reported cases, there was no severe complication of anemia or thrombocytopenia such as ischemia or bleeding. The hepatic dysfunction in GD patients ranges from asymptomatic biochemical abnormalities to overt hepatitis with either hepatitis or cholestatic injury. Alkaline phosphatase (ALP) is the most common hepatic enzyme to be raised in hyperthyroid patients at diagnosis (25%–64%). However, initial rise in ALP level may be of hepatic or bone origin. Hence, to diagnose hepatic dysfunction, it is important to check other hepatic markers. The possible hypothesis for liver dysfunction could be relative hypoxia due to increased oxygen demand with unchanged splanchnic blood supply, which leads to hepatic dysfunction and cholestasis in the centrilobular hepatocytes, congestive heart failure, or associated autoimmune liver disease. In the present case, all the immunological markers for autoimmune hepatitis were negative. Therefore, possibly, the hepatic dysfunction was due to cholestasis. However, the bilirubin level normalized, but there was an increase in ALP level. This may be due to an increase in osteoblast activity. Thyroid uptake scan in the present case showed unusually high tracer uptake. This along with very high FT3 and FT4 level shows high severity of GD. Hence, very high thyroid uptake on scintigraphy may suggest the need of hematological and hepatic parameter evaluation. The main challenge in this patient was the treatment as thionamides are known to cause agranulocytosis and are also hepatotoxic. However, the incidence of pancytopenia with thionamides is rare and incidence of agranulosis with ATD is 0.1%–0.5%. On the other hand, radioiodine ablation initially may lead to thyroid storm. Therefore, we preferred to treat the patient with ATD for 3 months initially and then radioiodine ablation was done. We carefully monitored the patient's hematological and hepatic parameters during the ATD. There was an improvement in hematological and hepatic parameters with ATD and radioiodine (except ALP level as described). As in the present case, in all the reported cases, pancytopenia was corrected after correction of thyrotoxicosis irrespective of the chosen treatment modalities. In all patients with thyrotoxicosis, at initial diagnosis, hematologic and hepatic evaluation should be considered. This is more important when these patients are treated with ATD as close follow-up will be needed. ATD and radioiodine ablation can be used in patients with GD associated with hepatic dysfunction and pancytopenia; however, close follow-up of hematological and hepatic parameters is essential. If there is no prompt improvement in hematological parameters with improvement in thyroid function test, further evaluation for pancytopenia must be considered. Finally, thyrotoxicosis should be considered in the rare differential diagnosis of pancytopenia. Davies TF. Graves' diseases: Pathogenesis. In: Braverman LE, Utiger RD, editors. Werner and Ingbar's the Thyroid: A Fundamental and Clinical Text. Philadelphia, PA: Lippincott Williams and Wilkins; 2000. p. 518-30. Jacobson EM, Tomer Y. The CD40, CTLA-4, thyroglobulin, TSH receptor, and PTPN22 gene quintet and its contribution to thyroid autoimmunity: Back to the future. J Autoimmun 2007;28:85-98. Hambsch K, Herrmann F, Fischer H, Langpeter D, Mäller P, Sorger D, et al. Changes in the blood picture in hyperthyroidism. Z Gesamte Inn Med 1989;44:300-6. Lima CS, Zantut Wittmann DE, Castro V, Tambascia MA, Lorand-Metze I, Saad ST, et al. Pancytopenia in untreated patients with Graves' disease. 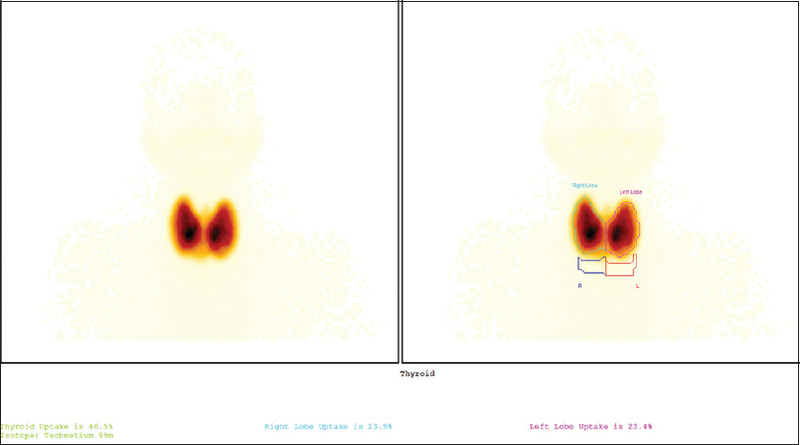 Thyroid 2006;16:403-9. Garla VV, Abdul Salim S, Yanes-Cardozo LL. Pancytopenia: A rare complication of Graves' disease. BMJ Case Rep 2018;2018. pii: bcr-2017-223887. Baagar KA, Siddique MA, Arroub SA, Ebrahim AH, Jayyousi AA. Atypical complications of Graves' disease: A case report and literature review. Case Rep Endocrinol 2017;2017:6087135. Talansky AL, Schulman P, Vinciguerra VP, Margouleff D, Budman DR, Degnan TJ, et al. Pancytopenia complicating Graves' disease and drug-induced hypothyroidism. Arch Intern Med 1981;141:544-5. Shaw B, Mehta AB. Pancytopenia responding to treatment of hyperthyroidism: A clinical case and review of the literature. Clin Lab Haematol 2002;24:385-7. Kebapcilar L, Yeşil S, Bayraktar F, Saklamaz A, Demir T, Güngör O, et al. Recovery from pancytopaenia and liver dysfunction after administration of propylthiouracil for Graves' disease. N Z Med J 2005;118:U1615. Jung RS, Parghane RV, Sood A, Bhattacharya A, Mittal BR. Primary autoimmune thrombocytopenia and co-existing Graves' disease: Role of radioiodine-131. Indian J Nucl Med 2014;29:195-6. Jha P, Singh YP, Ghimire B, Jha BK. Pancytopenia in a surgical patient, a rare presentation of hyperthyroidism. BMC Surg 2014;14:108. Rafhati AN, See CK, Hoo FK, Badrulnizam LB. A report of three cases of untreated Graves' disease associated with pancytopenia in Malaysia. Electron Physician 2014;6:877-82. Garcia J, França LD, Ellinger V, Wolff M. Marrow hypoplasia: A rare complication of untreated Grave's disease. Arq Bras Endocrinol Metabol 2014;58:953-7. Doran GR. Serum enzyme disturbances in thyrotoxicosis and myxoedema. J R Soc Med 1978;71:189-94. Sarinnapakorn V, Noppavetchwich P, Sunthorntepwarakul T, Deerochanawong C, Ngongamrut S. Abnormal liver function test in Graves' disease: A prospective study of comparison between the hyperthyroid state and the euthyroid state. J Med Assoc Thai 2011;94 Suppl 2:S11-6. Cooper DS. Drug therapy: Anti-thyroid drugs. N Engl J Med 2005;352:905-17. Pincet L, Gorostidi F. Graves disease causing pancytopenia: Case report and literature review. Clin Med Insights Case Rep 2018;11:1179547618781090.